My recent piece and blog post: “The making of Ol’ Skool” reminded me of a situation a few years ago to revisit and revive the days when shafts were either aluminum or wood, heads were not offset and REAL stringing was “traditional”. Having such things today and going against the current trends sets the definition of “Going Old School”. I was the assistant varsity coach of the Poly Prep School in Bay Ridge, Brooklyn and we were in Orlando, Florida for pre-season training in the early-March days. Our hotel accommodation at The Disney Wide World of Sports complex, was one of many housing numerous high-school lacrosse programs in the country for the same reason, that the turnover of teams checking in and checking out was at a fast and steady pace. Due to that circumstance our rooms were not ready for us to settle in, thus we had some time on our hands. To make time pass, some kids “tossed the rock” in the parking lot, while others spent time listening to their iPods or did whatever their individual creativity opened up to. Having no idea what she had found, she held in her hand an original, white, scuffed, scraped, unstrung, STX Excalibur head – one of the MOST popular and BEST lacrosse heads ever produced! Who would’ve thrown such a thing away or leave it behind? I decided to take it. By doing just that I gave it a new life but keeping the traditional, old school characteristics that I remember. The following series of photos portray the revival of the STX Excalibur “going old school”. STX Excalibur. Strung traditional, wide, 6-diamond, nylon shooter lace and two hockey laces on a wooden shaft. 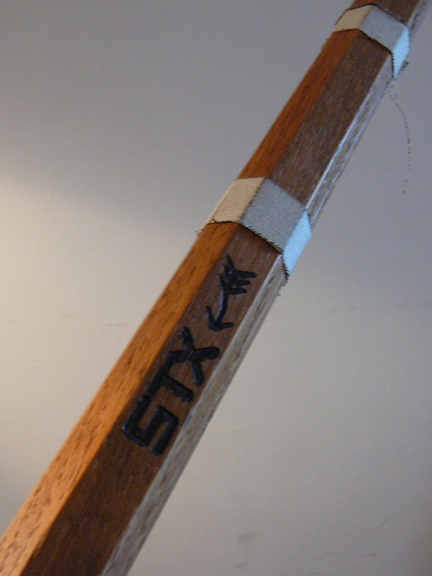 My STX “Crooked Arrow” shaft. This was used during practice sessions in high school. With Brooks Sweet (All-American, UMass ’80. Member of Team USA 1982—“Player of the World”). Currently, Head Coach of The Poly Prep School (Bay Ridge, Brooklyn). “The Trio” (Jon Hess, Chris Massey, Jesse Hubbard). 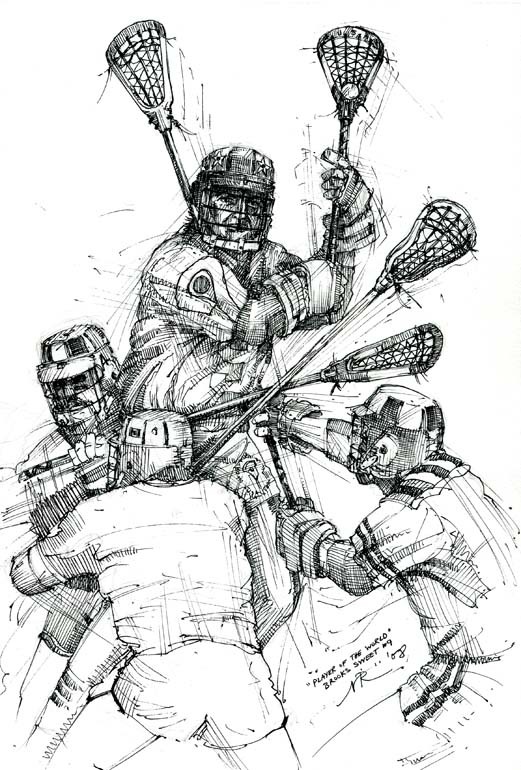 Considered the BEST attack unit college lacrosse. 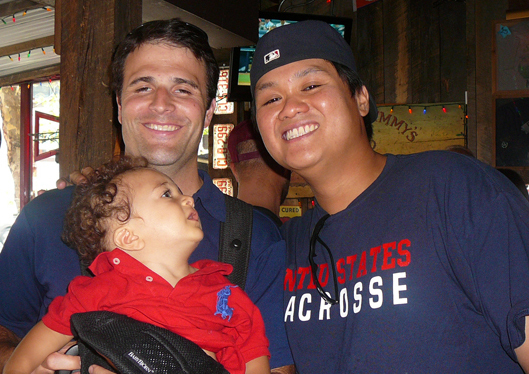 With Chris Massey (Princeton ’98) and his son Oliver, during the screening of the USA/Canada 2010 World Games Championship game at Brother Jimmy’s in Manhattan. 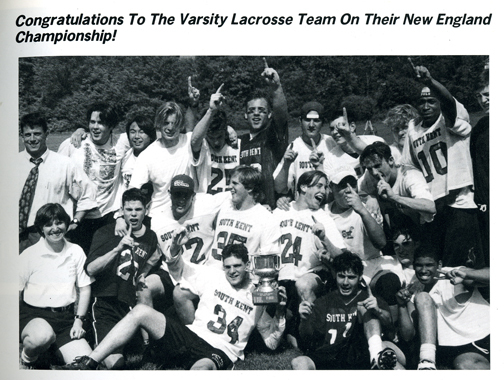 Winning the New England Championship title – May 1995. The making of Ol' Skool.